David Gerdes is interested in using galaxy clusters to tell us about how the large-scale structure in the universe has evolved over time. He’s worked on methods for measuring the redshift of galaxies, and is currently combining DES data with spectroscopic measurements to measure cluster masses. He is also interested in using DES to learn about something much closer to home—the population of the outer Solar System. 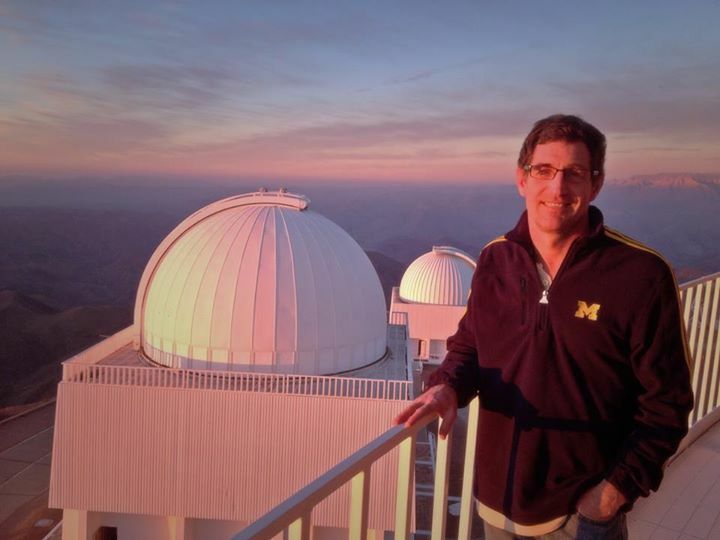 He has worked with other DES members to discover several dozen new trans-Neptunian objects in DES data, with many more hopefully to come over the next few years. I think science is fundamentally about being curious, creative, and playful. I like working with smart people and playing with really cool toys. The moment of discovery, when you know something that no one else knows yet, happens less often than non-scientists probably think, but when it does you never forget it. As a young kid I watched the Apollo landings and read a lot about astronomy and physics. My dad was a chemist and my mom was an elementary school teacher, and they encouraged my interests, even when I was turning the laundry room into a telescope mirror-grinding facility. What I lack in coordination and agility I make up for in a willingness to tolerate pain and suffering while moving in a straight line at constant speed. I’ve finished seven marathons and four half-iron triathlons. There is great beauty in the natural world–the kind that appears readily to your senses, like the starry skies in Chile, and the less tangible kind that comes from understanding just a little bit about how it works. I find that learning more as a scientist enhances the experience of both kinds of beauty. I was actually taught how to blow glass because it was supposedly a valuable laboratory skill. I’ve never had to do it. We’re saving plenty of problems for you!